Put Your Brand In Motion! My Gorilla Graphics, a division of the veteran 3D marketing company Inflatable Images, has grown significantly in the past few years. 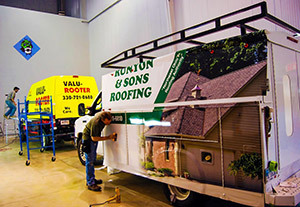 What began as simply producing and installing standard vehicle graphics blossomed into a creative full-service venture of its own. Since its inception, My Gorilla Graphics has become one of the leading vehicle wrap facilities in northeast Ohio. We offer more than just vehicle wraps, we are a design, print and expert installation facility. Our goal at My Gorilla Graphics is to get you the best return on investment your marketing dollars can buy. Our consistent service and superior graphics generate repeat business from companies and individuals alike. Our vehicle wraps and graphics not only reflect your business, but also reflect ours and we refuse to do anything that is less than our highest quality work! With more than 32 years collectively in the vehicle wrapping industry, our installers and graphic artists are some of the finest in the business and settle for nothing short of spectacular in their designs and installations. Our team will work with you to understand your brand, budget and your vehicle patterns to design a custom vehicle wrap that promotes your brand identity. From vans to large semi-trucks, our team has you covered!